I'd like to personally wish everyone a very merry Christmas 2013, not forgetting those who don't celebrate this holiday, so happy Holidays to you too! In the spirit of the festivities I wanted to take a quick look at Christmas and its relation to intellectual property law. Even though the holiday is incredibly old (with further ties to pagan traditions aside from its religious connotation), it still ties in very deeply with modern intellectual property rights in a lot of ways. 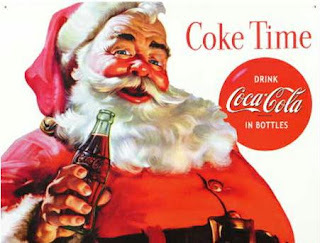 The more notable image of Christmas these days is arguably the Coca-Cola campaigns which hit the scene every year. Some efforts have been made to thwart St. Nick's ties with the popular soda pop brand, with little or no damage done to the association between the two, especially during Christmas. The image of Santa in the Coca-Cola adverts is actually protected as a registered trademark; something which most people will not necessarily think of. The popular image was concocted by Haddon Sundblom in 1931 for the beverage company - having been used for almost a century. For a more Coca-Cola oriented history of old St. Nicholas, please refer to their 5 Things You Never Knew About Santa Claus and Coca-Cola article from 2012. Certain songs also evoke feelings of Christmases past, sitting around with your family and enjoying the season in the ways you had done for years, maybe even generations. Classics like "We Wish You a Merry Christmas", dating back to the 19th century, and "The Twelve Days of Christmas", dating all the way back to the 16th century, are a part of the holiday for most cultures which celebrate them all over the world. These songs have long since passed their copyright prime; however newer renditions of older songs or even modern creations still may remain under copyright. For example a very popular song in the US for the Spanish speaking community is the song "Feliz Navidad", and the song "Frosty the Snowman" both remain protected under copyright, limiting their use even during the season. This has very little impact on people overall, but still remains a notable thing for most. A selection of song remain very popular during Christmas, and showcase quite well how important the public domain is, and how profitable it also can be. As one can see Christmas is still very entwined with intellectual property rights, even in the modern day. This should still not serve as a deterrent for your own personal celebrations. I hope you will all have a great break from work, enjoy some quality time with those who you love and remember, 'tis the season of giving. Have a happy end of the year!